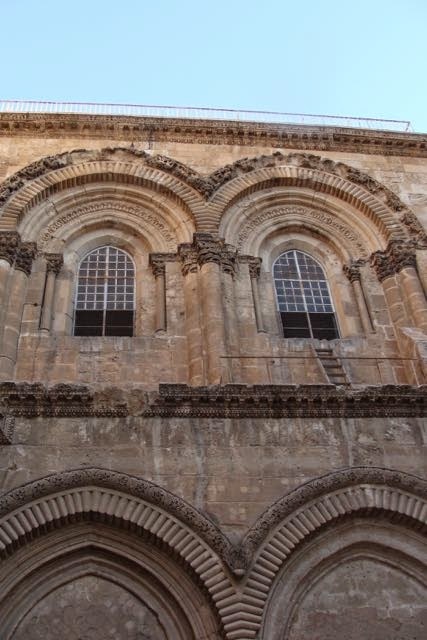 We, all of us, get up very early to go to the Church of the Holy Sepulcher. 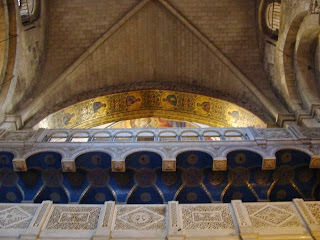 I am reminded of how I did this same thing some forty years ago, when a Roman Catholic priest friend of mine invited me to accompany him to, as he said, “say mass at the Holy Sepulcher.” By that I assumed that he meant the church, but actually he had received permission to say mass at the actual sepulcher. A nun friend was with us and he invited me to read the Easter Gospel from this place. That has become a great memory for me, and it was kindled again as we walked around this wonderful church. 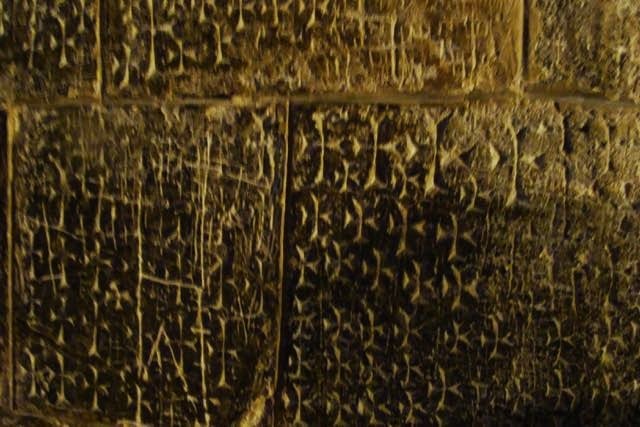 We head down to Calvary, but are unable to visit the Latin chapel – it is closed off, but as we go down, I point out to Arthur that which had impressed me so many years ago – the incision of crosses, graffiti from countless pilgrims over countless years. Arthur is reminded of the emotions we had at Santiago when we climbed up the steps behind the altar to embrace the bust of Saint James – again, so many pilgrims. 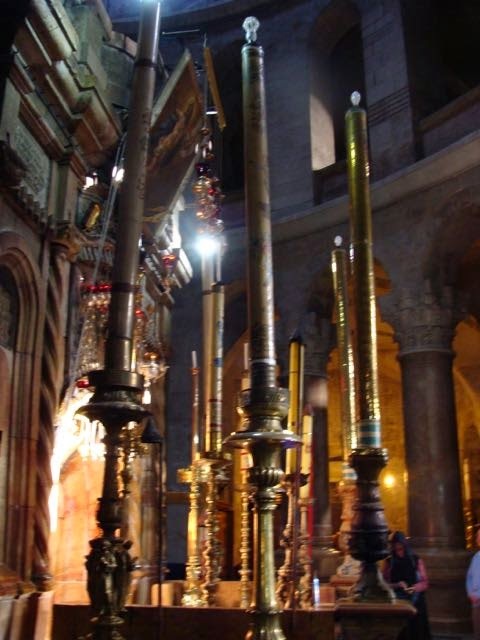 So many Paschal Candles at the entrance of the tomb, one for each of the ecclesial groups exercising rights at the church. In a way it’s a sad commentary – we are not one, but in another way it is like all the crosses – so many pilgrims. 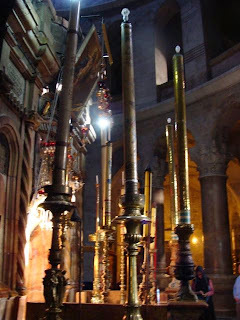 The church is layer upon layer, Byzantine, Crusader, and not so modern accretions. It’s layers bespeak all the peoples who come here, and one can only hope that the pilgrim can see Christ in the midst of it all. If you look closely at the picture below, you can see him (as Pantocrator) peaking down from the dome above. 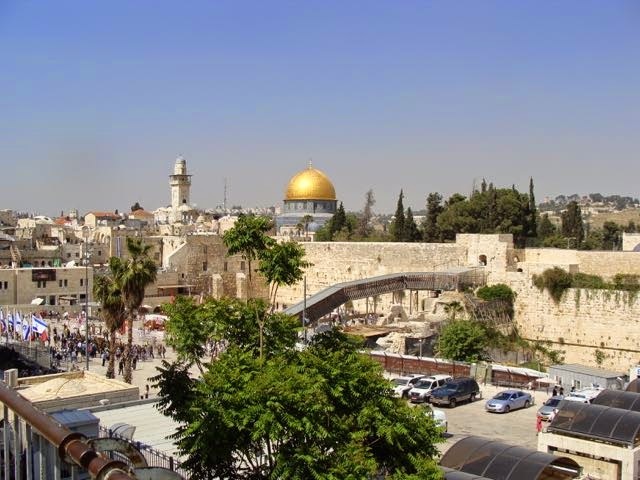 I have been moved to prayer at several points on this pilgrimage – I guess that is what it is really all about. 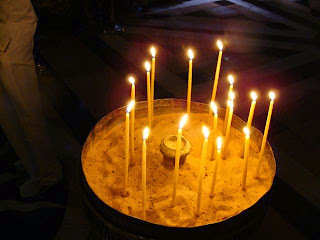 There are ample opportunities to embody the prayer in candles, and in the Chapel at Golgotha I am moved to light one, again, for my friend Patrick. As I look at all the candles, I wonder what intentions are expressed in their flames. 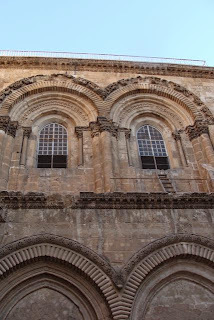 We stand in line to go into the Holy Sepulcher, and I do have my camera with me. I begin to turn on the camera, and realize at the last minute that this is a sight that needs to remain in my mind and heart and not in the pixels on my computer. 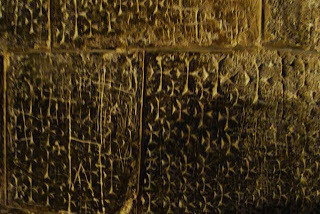 So I put the camera aside, touch my forehead and lips to the stone and then leave. 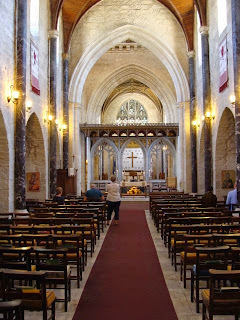 Next we go to Saint George’s Cathedral, the seat of the Episcopal Bishop of Jerusalem, and the Anglican Archbishop of Jerusalem, nicely the same person. Andrew Nunn, our Rector General says mass here, and it is the tradition of the Society to concelebrate. This province, however, does not allow for the ordination of women as priests – so I sit this one out, worshipping from my pew, praying for greater inclusion. We have lunch in the guesthouse, and the Dean addresses us briefly. A nice time is had here. We go back to Notre Dame, and then head over to the Jaffa gate. 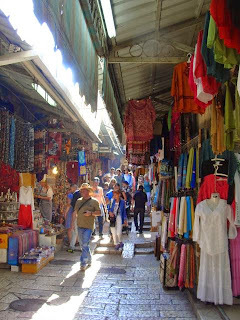 I recall some nice shops with contemporary Israeli goods there – but they are gone, replaced by ubiquitous stores selling T shirts, icons, olive wood, and yarmulkes. My memories of the Suq are called to mind whenever I open a bottle of cumin. 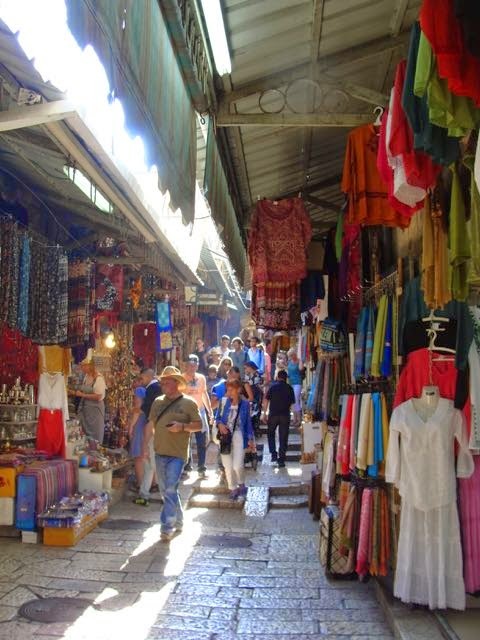 Now those odors are largely gone, as the Suq has evolved into a series of shops largely catering to tourists. The charm of the old Suq is gone. My sense of direction serves me right and we end up at an overlook by the Western Wall. We descend to the plaza and go through security, and make the mistake of going over to the women’s area and kindly directed to the left. 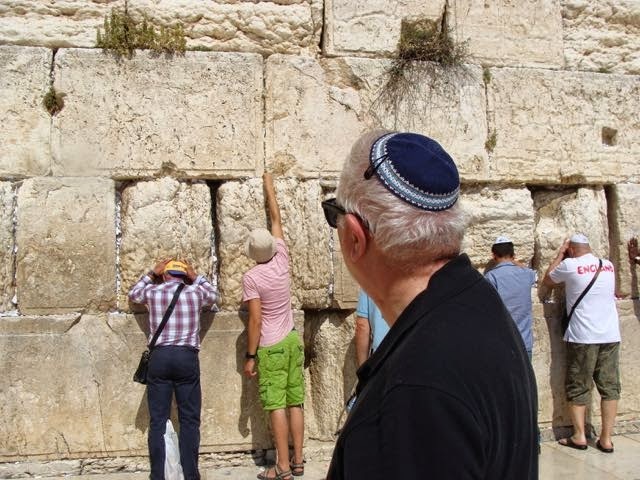 We put on our yarmulkes, and join the men at the wall. I am moved to pray. So I touch my hand the wall, and rest my forehead on the Herodian stones, and a flood of prayer comes pouring out and tears as well. Later as we walk into the arches area, the sight of all the men with the psalters, their rhythmic movement, and their intensity moves me again, and I am at a loss for words to explain it to Arthur. Later over a mint-lemonade and a date drink we talk about the source of these feelings. Perhaps it’s realizing that a great deal of time has passed and I am no longer the young man I was when I was here last, or perhaps it is just the spiritual strength of all those men around me that moves me. I had this experience at the Church of Holy Nativity as well. Perhaps it is a desire to believe with greater fervor. 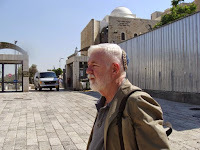 We walk through a market, hoping to get to the Temple Mount and the dome of the rock, but we are turned back – “only Muslims!” So we walk back and on the way I go into the icon store that the Greek Orthodox Patriarchate operates. There I finally find an icon of Saint Mark, and a blessing cross. Arthur will gravitate to the Armenian ceramic shop and find lovely things there. Later there’s a banquet and good conversation. It’s a fully human kind of day.